... It is about time of seizing control over our life, a dignified life, such as any human being deserves. With such words commenced a note that was circulating in Quito (Ecuador) during the 4th World Social Forum on Migration in October 2010, written by migrants belonging to several associations (among which ARCI) from different countries. Following this message, a crowded international meeting was held to discuss the organization of a global day of strike and mobilization for the rights of immigrant workers, for their dignity, against racism and for justice. Based on the experience of transnational mobilizations in the United States and Mexico, and of March 1, 2010 in Europe - defined as "A day without us", the participants to the meeting talked about the best way in which all migrants, their families and their friends, simultaneously, could let their voices be heard everywhere: in their countries of origin and in those of destination, and by everyone: national governments and international institutions, decision-making bodies and political parties of all orientations, but also by the single citizens, still allowing fear and diffidence to stand in the way with respect to migrants, risking of being sucked into the vortex of xenophobia and racism. 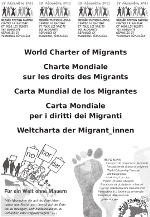 Thanks to this rich and composite discussion, the assembly of World Social Forum on Migration could approve a motion for a 18th December 2011 of mobilization and strike on a global level against racism and for the rights and dignity of all migrants, refugees and displaced persons. The social movements pointed out that it was a single struggle to claim the right to migrate or not, the right to stay, without being displaced forcefully. Edda Pando, of ARCI Association, specified: "A single struggle that would allow us to get to know and recognize each other, reflecting the identity of all those who share the perspective of cohabitation, solidarity and acceptance of different cultures and different beings, and conveying a message to national governments and international institutions, and to all civil societies as well." "Human beings must have the right to choose, freely and independently, where they want to live: whether they prefer to stay where they feel their roots are, or to seek their realization in a different place. But states, economical powers and political structures that are alien from the everyday life of women, men and children in this world, impose, through violence and unjust laws, their arbitrary choices. It occurs by means of "dislocation" programs, deportation and "human displacements", but also due to the infinite obstacles in the way of migrant workers, of their families and of their right to stay in the countries they decide to immigrate to. The right to choose where to live is a primary human right. But it is violated everyday. An extraordinary mobilization is necessary to conquer it, affirm it and defend it." In the assembly dedicated to these topics, the movements evaluated whether the traditional strike could be a suitable instrument to express the claims of migrant peoples in every corner of the planet. It was decided to call it "global action", so that in every country or geographical area there would be the possibility to choose the most appropriate way of mobilization according to the local conditions. The date of 18th December was chosen for its symbolic value: on that day in 1990 the United Nations adopted the "International Convention on the Protection of the Rights of All Migrant Workers and Members of their Families". A declaration of principles that in many cases did not enter into force (and, moreover, not ratified by any Western Countries). Only a few weeks to go. In many countries they are discussing and assessing the mobilizations to be performed.